NEXTRA MID Design is a design environment for 3D electrical carriers called MID (Molded Interconnect Devices). 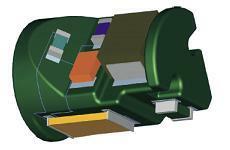 MID contain a 3D mechanical carrier with several 3D surfaces and routing can be done on all surfaces. This routing and component placing on the surface of the 3D geometry will make the use of additional PCBs for electrical functionality redundant. As a result, weight and fitting space can be effectively reduced. Electrical components are placed on flat surface areas.